In Europe and all over the world, mass violence and genocide have been a structural feature of the 20th century. The research programme, Corpses of Mass Violence and Genocide, aims at questioning the social legacy of mass violence by studying how different societies have coped with the first consequence of mass crime: the mass production of cadavers. 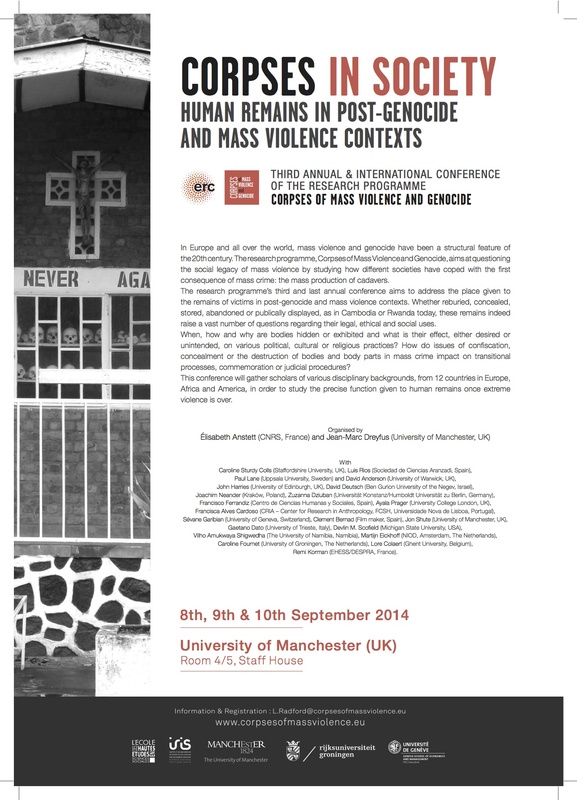 The research programme’s third and last annual conference aims to address the place given to the remains of victims in post- genocide and mass violence contexts. Whether reburied, concealed, stored, abandoned or publically displayed, as in Cambodia or Rwanda today, these remains indeed raise a vast number of questions regarding their legal, ethical and social uses. When, how and why are bodies hidden or exhibited and what is their effect, either desired or unintended, on various political, cultural or religious practices? How do issues of confiscation, concealment or the destruction of bodies and body parts in mass crime impact on transitional processes, commemoration or judicial procedures? This conference will gather scholars from various disciplinary backgrounds across 12 countries in Europe, Africa and America, in order to study the precise function given to human remains once extreme violence is over. Caroline Sturdy Colls (Staffordshire University, UK), Luis Rios (Sociedad de Ciencias Aranzadi, Spain), Paul Lane (Uppsala University, Sweden) and David Anderson (University of Warwick, UK), John Harries (University of Edinburgh, UK), David Deutsch (Ben Gurion University of the Negev, Israel), Joachim Neander (Kraków, Poland), Zuzanna Dziuban (Universität Konstanz/Humboldt Universität zu Berlin, Germany), Francisco Ferrandiz (Centro de Ciencias Humanas y Sociales, Spain), Ayala Prager (University College London, UK), Francisca Alves Cardoso (CRIA – Center for Research in Anthropology, FCSH, Universidade Nova de Lisboa, Portugal), Sévane Garibian (University of Geneva, Switzerland), Clemente Bernad (Film maker, Spain), Jon Shute (University of Manchester, UK), Gaetano Dato (University of Trieste, Italy), Devlin M. Scofield (Michigan State University, USA), Vilho Amukwaya Shigwedha (The University of Namibia, Namibia), Martijn Eickhoff (NIOD, Amsterdam, the Netherlands), Caroline Fournet (University of Groningen, The Netherlands), Lore Colaert (Ghent University, Belgium), Remi Korman (EHESS/DESPRA, France).